I have been saving up a decent bit of money for a project car of my own and I narrowed it down to either buying a Baja Bug or a NA Mazda Miata. I have questions about the bug. I don't live near any deserts because I am in Memphis, Tennessee, but there are tons of decent off-roading spots and muddy areas and I was wondering how capable the bug was in conditions like that. I was also wondering what else I could do with it since I won't be riding any dunes or traveling in the desert. I am very much leaning toward the bug over the Miata but I want to be sure before I buy one. As a side note, does anyone know how much it may cost to fix a seized engine of a bug or would it be better of buying a crate engine. I drove a pan buggy Maryland for 5 years back in the 1970 ish... I used stock tires to get them to spin in the clay.. the car would go anywhere.. loved out doing the 4x4. as for mud... it did better than you would think ... water crossing ... I didn't have a body so it would sink and I would drive right thru. with my Baja I would open the doors because the car would float. as far as the seized motor... take it apart and see what damage has been done... if you hurt the block you are done. everything else can be fixed. Bugs are incredibly capable, especially compared to a stock 2 wheel drive vehicle. My bone stock 68 bug with 31" military tires goes places that my 83 Toyota on 32" MTs wouldn't even go with a rear TruTrac locker in 4 wheel drive. 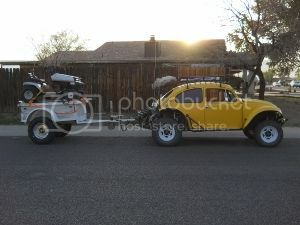 You can run trails faster and harder in bugs too and they are extremely reasonable to buy and build. I guarantee you'll have way more fun in a Baja Bug that can go anywhere off road than you will in a Miata thats strapped to the street! As for the motor, don't buy a crate motor!! Unless you want to spend a ton on a crate engine ($6000+) your money will be wasted. Air-cooled VW motors are some of the easiest to rebuild if you have access to tools and a garage, and parts are cheap. If not take it to a local VW shop for a rebuild, or even buy a used motor on CL as long as the guy has paperwork on it and lets you hear it run. Or...just buy a bug that already has a boss motor in it. You can pick up a good running bug that someone else has spent good money on for $2000-$3000 all day long and save yourself the cash and trouble of worrying about the motor so you can focus on more fun/important things. The scariest part of a vw bug is the air cooled motor! It's not enough to hear one run you have to drive it for a minimum of 15-20 minutes to get the oil hot so you can see if it still has oil pressure after it warms up. Always check end play because that will give you an idea how many miles are on motor and if it's hammered out the case might not be any good. What he said. A bug is fun off-road car.